This photo suggests a third jersey this year with orange shoulders. Is the blue home jersey back? Omission in the retired numbers, missing Al Hamilton #3. Liking the navy blue.. have a better idea if they showed the whole jersey. How did the Oilers miss Hamilton? I'm a little confused here. The retired numbers are on the 40 year patch.. all except Hamilton's. Clickiest organization ever only includes jersey numbers part of said click. The six numbers on the crest were the only Oiler Players of the Banners displayed currently, who were with the team on the 5 Cup...... " run ?" . -Don't mess with old folks, they didn't get old by being stupid. Someone hasn’t been looking up at Rogers Place lately...Hamilton is right up there along with the greats from the Dynasty Years, plus Sather’s 5 Cups banner and the goofy looking Rod Phillips one. Hamilton wasn’t up there for years because the Oilers thought the NHL wouldn’t be happy to see a WHA defector’s number, but when they’d retired a bunch of the others they finally hung it up. Even had an Al Hamilton Night. I think his was in the rafters before Messier’s even. Hamilton was not there for the run..... the Cups and the names were synonymous with the "run" . .... That's what the crest tells me . That patch would look great with a guitar on it! Yup just a random guitar, a departure for no apparent reason other than Garth's banner! Do it Oilers! I would spend 5 dollars to know where that banner is. 12 dollars to buy it. Part of Koskinen's signing bonus. Typical. Sell history for a mediocre present and future. We're not doing what made us successful people. Oilers blew it by retiring his number to begin with. The patch is recognizing 40 yrs in the NHL. Hamilton retired the 78-79 season, the Oilers first ever NHL year. He had no impact on the NHL team. So why should he be recognized for something he had nothing to do with? If you want to make a case for someone getting snubbed (which I am not), I think the case can be made for Kevin Lowe. He was their first ever NHL draft pick, scored their first goal, was a critical member of all 5 of their cup teams, was a coach, GM, manager, heavily involved in the community and has been here for most of his life. If this was a patch recognizing the Edmonton Oilers existence as a franchise which includes the WHA, then as a retired guy, Hamilton should be on it. But it's not, it's the NHL. Hamilton had nothing to do with the NHL team. 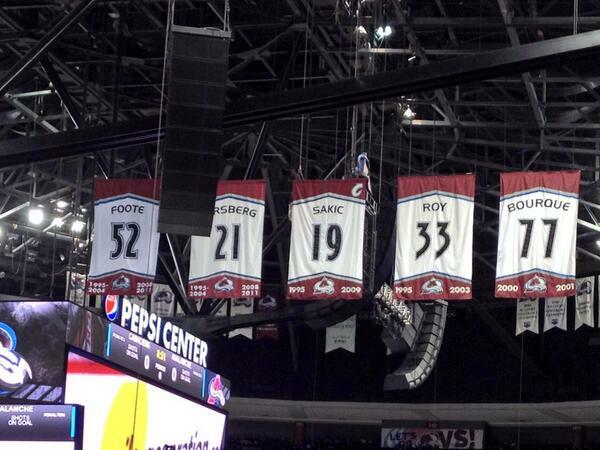 wait.. Colorado actually retired.. Bourque? Foote is a pretty dodgy retirement too. I'd argue Rob Blake, while not a good pick due to his relatively short tenure there (five seasons), would have been a better pick than either Foote or Bourque. At least Foote was a lifetime franchise player, Bourque was a rental.. still laughing! Probably true.. might be a relatively weak pick.. but who knew they'd have teams with super-stars that would go on to win 5 Cups? Probably a few teams with retired numbers that are a few tiers below today's required threshold for jersey retirement. Should have just left the numbers off the patch.. everyone knew who was on the teams, plus... its celebrating 40 years of the franchise, not 6 players. Those 6 players would agree. He was an Oil King as a teen, was an original Alberta Oiler, was one of the best players the WHA, was with the Oilers for their entire WHA life, played a short time with the NHL Oilers but had to retire due to an eye injury. Jersey was retired during the first game of the 1980-81 season, which made sense at the time to build some tradition with a new team. Was he of the calibre of other players they have retired? Probably not. Did he deserve to have his number retired? Absolutely.